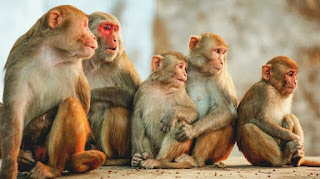 Invasion by monkeys is forcing many residents of Soluyi/Sosanya community in Gbagada, Lagos State, to flee. Some of the residents told NAN on Monday that they could no longer withstand the situation. They called on the state government to save the community from the trouble, saying that the animals forced their ways into their rooms, destroying window and door nets, foodstuff and other items. Adigun Olaleye, chairman of the community’s landlord association, said it had become difficult for the community to curtail the monkeys and their destructive attitude. “The monkeys are in the habit of tearing the protective nets on windows to gain entrance and eat whatever they find in the house. I have had to replace the protective nets several times; I am tired of doing it. “One of my neighbours, while trying to pour chemical on a monkey fell in the bowl of the chemical; she had to be rushed to a hospital. “We have tried to poison them on many occasions, but those monkeys are too smart; once they perceive the smell of the food, they usually detect it has been poisoned. Some of them have been killed with guns, but we cannot keep shooting in a residential area; it is very risky. Another landlord, Oluwatosin Aregbesola, told NAN that his tenants were no longer feeling safe in the house because of the monkeys. “The monkeys enter kitchens to eat our soups and any foodstuff on the shelf,” he said.